Ellis Boat Charters – We offer powerboat boat rentals and bareboat yacht charters for cruising the Maine and New England coast. 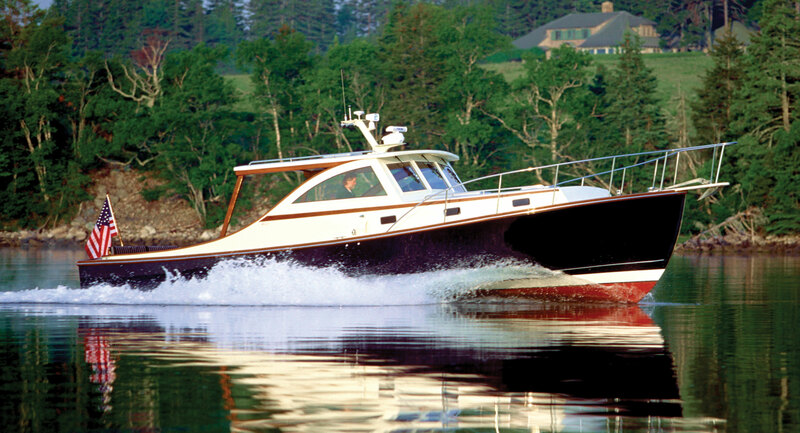 Our charter fleet currently includes a classic Bunker and Ellis, a Hinckley Talaria, and a number of Ellis 36s. All Charter vessels include a tender and proper cruising/safety equipment. Ellis Boat Company maintains the vessels and provides 24/7 service. All charter boats are properly insured and extremely well-maintained including up-to-date and fully operational equipment. Explore Maine and New England’s offshore islands and diverse coastal communities with a classic Maine-built boat – available through Ellis Boat Charters out of Southwest Harbor, Maine. Your bareboat charter starts with an Ellis Boat Company representative giving a full tutorial on the operation of the vessel. This will likely be followed with a cruise out of Southwest Harbor or Northeast Harbor up Somes Sound surrounded by Mount Desert Island and Acadia National Park. If you choose, you can hire a Captain who is familiar with local Maine waters. Click the links below for destination ideas, common questions, and booking procedures. Select a Boat – For a brief description & calendar. Now accepting charter clients on our NEW 2019 Ellis 36 Express Cruiser "yet-to-be-named", complete with that "new boat smell". Other special features include extra headroom (for you tall boaters out there), a 2-seat "breakfast bar" in the cabin, transom door, large swim platform, and an electric remote control davit system for the matching Ellis tender. Additional information and photos here: CHARTER BOAT DETAILS. A New Ellis 36 - complete with that "new boat smell!" Available for day-charters or multi-day rentals with a Captain, this classic Bunker & Ellis 42' "Jericho" is widely considered to be the most famous of the Bunker and Ellis vessels built in the mid-1900s, and is the ideal boat for those seeking a historical Maine maritime cruising experience. Additional information and photos here: CHARTER BOAT DETAILS. The Ellis 36 Express Cruiser - "Eggemoggin Express"
Another beauty built by Ellis Boat Company, this Ellis 36 is spacious and wonderfully functional for Maine coastal cruising. Similar to the other Express Cruisers we have in the charter fleet, this boat will provide comfortable and worry-free boating with some admired Ellis features. Additional information and photos here: CHARTER BOAT DETAILS. The Ellis 36 Express Cruiser - "Too Priceless"
"Queen of the Cove" - An Ellis 36 Extended Top Cruiser. Accommodations include a generator, heat/air, a freshwater head, separate shower, and full galley. The "Queen" is powered with a 420 Yanmar, which gives her a nice cruise of 15-18 knots with a top end of 23 knots. Additional information and photos here: CHARTER BOAT DETAILS. "Queen of the Cove" - No longer RED, she has been painted BLUE. Built for cruising on the Maine coast, this "Downeast Flybridge Cruiser" was built by Don Ellis and Ellis Boat Company. The yacht includes dual helms, heat and air conditioning, and ample interior space as well as exterior space. Additional information and photos here: CHARTER BOAT DETAILS. This Ellis 36 Express Cruiser is built with an extra long cabin allowing for a settee and extra sleeping accommodations below. Charter features include a large mounted grill in the cockpit and a big tender with 9hp Yamaha outboard. Additional information and photos here: CHARTER BOAT DETAILS. When you charter a Hinckley Jet Boat, you avoid the prolific lobster trap lines that populate the Maine coast. The Hinckley Talaria charter boat is outfitted for overnight stays, although many charter clients use this vessel for day-trips in conjunction with a Captain and sea-side accommodations. Additional information and photos here: CHARTER BOAT DETAILS. The Hinckley T40 "Timbuktu" - Cruise in style & speed, avoid lobster lines.